This connection box, consisting of a JACK auxiliary socket and a USB port, is located on the centre console. It allows the connection of portable device, such as a digital audio player of the iPod ® type or a USB memory stick. It reads the audio file formats (MP3, OGG, WMA, WAV, ...) which are transmitted to your audio system and played via the vehicle's speakers. You can manage these files using the steering mounted controls or the audio system control panel and display them in the instrument panel screen. When the USB port is used, the portable device charges automatically. 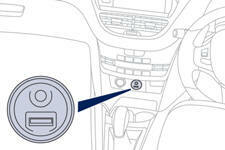 For more information on the use of this system, refer to the "Audio and Telematics" section.